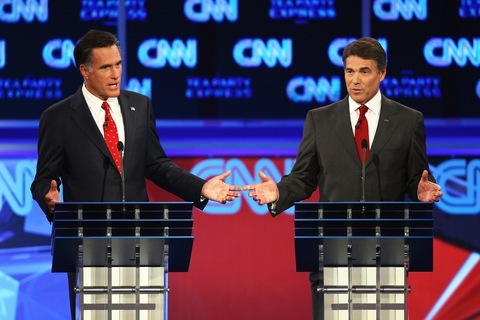 Mitt Romney and Rick Perry are set to square off again at Thursday night’s debate. Photo by Win McNamee/Getty Images. The two men in what has become a two-man race for the Republican presidential nomination each conducted national interviews Wednesday to help set the stage for Thursday night’s debate in Orlando, Fla. If Rick Perry and Mitt Romney get their way, the debate will be “Obama Lite” vs. Electability. In case you weren’t sure who Perry was suggesting is playing the role of “Obama Lite,” he got more specific in the follow-up. “When you take a look at what Mitt did from the standpoint of Romneycare in Massachusetts, you’re going to have a hard time finding a difference between Obamacare and Romneycare. I mean that’s just the facts and there is no way around it. The facts are the facts,” Perry said. Romney conducted his interview via telephone with USA Today’s Susan Page and clearly has one mission in mind: Create doubt among Republican primary voters about Perry’s ability to defeat President Obama in November 2012. “Perry, who jumped into the contest just six weeks ago, has dislodged Romney at the top of the GOP field in the USA TODAY/Gallup Poll. But the survey also shows Romney’s stronger appeal to swing voters and concern about Perry’s declaration that Social Security is a ‘Ponzi scheme’ for younger workers that needs overhaul. “Does that blunt talk make Perry unelectable? “Romney called it ‘a very disconcerting approach,’ then argued that the views Perry outlined in a book he published last year, suggesting that Social Security was unconstitutional, are ones he won’t be able to easily disavow. Quinnipiac University is out with a new poll helping Romney’s case. In hypothetical 2012 matchups, Romney bests President Obama, 47 percent to 40 percent, compared to Perry’s 42 percent to Mr. Obama’s 44 percent. In the race for the Republican nomination, Perry is in front with 28 percent, compared to Romney’s 22 percent. You can expect Perry to work overtime Thursday night to paint Romney as a liberal Democrat-sounding critic of his Social Security stance. And watch Perry play for the hearts and minds of conservative activist/primary voting Republicans while Romney plays for the general election hoping it inspires primary voters into thinking he’s their best shot at taking down President Obama. On Thursday, President Obama heads to the Brent Spence Bridge, which spans Kentucky (Senate Minority Leader Mitch McConnell) and Ohio (House Speaker John Boehner) — get it? — to urge Congress to pass his $450 billion American Jobs Act. After two days immersed in foreign policy at the United Nations, the White House is having the president immediately return to selling his jobs bill in an effort to keep its foot on the gas on the No. 1 issue for voters. And President Obama will get to take some new Gallup poll numbers with him on the road that show a majority of Americans support his plans in theory. “Americans generally favor raising taxes on higher-income Americans and eliminating tax deductions for some corporations as ways of paying for President Obama’s proposed jobs plan,” writes Frank Newport of Gallup. Unfortunately, what the president is unable to tout is unified support among Senate Democrats. Sen. McConnell’s office compiled a list of quotes from Democratic senators expressing concern about President Obama’s proposed pay-fors in his jobs bill, and there’s still no announcement from Senate Majority Leader Harry Reid as to when we will see the president’s plan hit the floor for debate and a vote. In the last presidential cycle, the Republican National Committee was derided for ineffectual leadership and an organization that was deeply in debt after it lost to then-candidate Barack Obama. At least in some respects it’s starting to turn that around. The Associated Press reports that the RNC raised $8.2 million in August, compared to just $5.4 million by the Democratic National Committee. The committee, however, remains very much in debt. The RNC reported $9.3 million in cash on hand, but is $15.9 million in debt. The Democrats are doing better: They have $16.6 million in cash and are $11.1 million in debt. On the Senate side, the Democrats are touting their cash-on-hand advantage at the Democratic Senatorial Campaign Committee. The DSCC raised $2.5 million in August and has $9.23 million in cash. It has raised $29 million this cycle, compared to the National Republican Senatorial Committee’s $27 million. The National Republican Senatorial Committee edged out the Democrats in August fundraising with a $2.96 million haul. The committee has $5.2 million cash on hand and is carrying no debt. Democrats face a tough challenge in the Senate, where they have to defend 23 seats compared to the Republicans’ 10 seats this cycle. On the House side, POLITICO reports that the Democratic Congressional Campaign Committee raised about $600,000 more than the National Republican Congressional Committee in August. The problem isn’t necessarily with the NRCC or its chairman, Texas Rep. Pete Sessions — whom GOP fundraisers credit with turning around the cash-strapped party campaign arm that suffered painful defeats in 2006 and 2008 before he took the reins in 2009. The NRCC has raised $17 million more this year than it did at this point two years ago and still beats the DCCC in cash on hand by more than $3 million. Instead, Republicans acknowledge, it’s the DCCC and its chairman, New York Rep. Steve Israel, who — at least when it comes to raising money — have exceeded expectations. However, Jessica Taylor at National Journal reports that the NRCC has $11.7 million in cash, compared to the DCCC’s $7.7 million. The DCCC has raised about $1 million more than the NRCC this year. House Republican leadership experienced a significant defeat Wednesday when a bill to temporarily fund the government failed on the floor, as some Republicans wanted it to cut more, and Democrats didn’t want to offset disaster relief money with spending cuts. The measure failed by a vote of 195 to 230. Harold Rogers, chairman of the House appropriations bill who brought the bill to the floor said he was “disappointed” so many Republicans didn’t support the bill. An aide to House Majority Whip Kevin McCarthy said she was “shocked” at the vote count and said the leadership took action on the bill based on assurances from Democrats that they would support the bill. Those Democrats announced earlier they would not vote for the legislation. House Speaker John A. Boehner (R-Ohio) had hoped to avoid another budget battle in the wake of the summer’s debt ceiling fight and a near-shutdown of the government in April that caused voters to sour on Republicans and Democrats in Congress. The rebuke gives new currency to Senate Democrats’ efforts to fund disaster aid without cuts elsewhere. Congress has just days to resolve the impasse as lawmakers are expected to recess Friday for the Jewish holiday of Rosh Hashana next week. The failure of the spending bill, which would’ve kept the government running until Nov. 18, raises the possibility that if the House and Senate can’t come to an agreement on a short-term funding bill, the government will shut down temporarily. This shutdown threat isn’t new to this Congress. Lawmakers argued for months over a funding debate this spring before enacting the funding level that expires at the end of September.